My good online friend Lynn Baber has a new book out. Just one of the many questions addressed in her book, Amazing Grays-Amazing Grace, is “Why does God allow bad things to happen”? 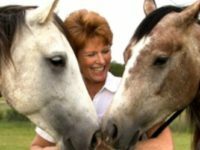 As you will find out Lynn has an abundance of experience with horses and their relationships to their owners and riders. Amazing things happen when you put a human on or around a horse. Perhaps you have experienced this too. Relationships don’t happen instantly and, as time goes by they either get better or worse. Lots of answers in this book. “WHY won’t my horse do what I want?” “WHY does God allow bad things to happen?” In her new book, Amazing Grays, Amazing Grace, author Lynn Baber suggests answers to these questions. The message of Amazing Grays is one of right relationship; how the relationships we have with our horses teach us about our relationship with God. The book contains 268 pages packed with Christian inspiration, motivation, and practical instruction for those willing to pursue amazing relationships with God, horses, and one another. Each chapter begins with a scripture and a quotation, and then develops the lesson using true horse stories from a retired equine professional with over twenty years experience as a trainer, breeder, judge, and consultant. ds us through the narrow gate to heaven. A popular title for the horse lover in your life, Amazing Grays makes a wonderful gift and is also being used in home schooling curriculums. Great information about horses, your spiritual relationship, your human relationships all here in Amazing Grays-Amazing Grace by Lynn Baber. Take a look today. You’ll be glad you did. If you would like to see samples from the book check them out at Amazon.com. If you would like to order a copy or two and get prompt delivery do that here. Please feel free to tell us some of the things that have inspired you regarding your life with horses and or God in the comments section below. I’m sure our readers would enjoy your stories and experiences. Lastly, I hope you enjoyed Why Does God Allow Bad Things to Happen? Amazing Grays-Amazing Grace. Also, I receive no income from the sale of this book. It was so good I just wanted to pass the information along. I know it will be of benefit to many. All the best.